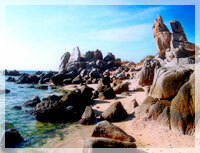 Hon Co - Ca Na Motel is located nearby National Highway 1A belonging to Ninh Phuoc district, Ninh Thuan province. It’s about 320 kilometres to the North of Ho Chi Minh city, 140 kilometres to the South of Nha Trang city and 150 kilometres to the East of Da Lat. With modern facilities and well-trained staff, Hon Co – Ca Na Motel will certainly be an ideal stop for visitors to enjoy the uniqueness of the nature. Coming to Hon Co to enjoy the most wonderful moment. With an area of 2 hectare, Hon Co is one of the hotels designed by motel style with 20 “Bungalow & Motel” chambers along the seaside and other services. - Traffic-way system in Motel is1600m2 for 24-seat car parking comfortable. - 8 Bungalows and 12 Motels towards the sea. - Each house included garage, terrace with flower trellis and bench. - A 3000 square-metre square can contain thirty-50-seat cars, a 20-square-metre entrance from No.1 National Road is safe for traffic. - Travel House has a lobby with an open space and large balcony. It’s an ideal place for visitors to have drink or take supper. - Minimart show-case supplies food, handricafts and local dishes. - 400-seat resraurent caters all of European, Asia and Vietnamese dishes. - Recreation services: Massage (Steambath, Sauna, Zaccuzzi), karaoke, billiard, tennis.